Tucked away in the old French quarters of the South Indian town of Pondicherry on Rue de la Caserne is a charming place called Le Dupleix. Having just stayed there and finding it thoroughly charming I would like to write a little about the establishment. Advertised as a luxury designer/heritage hotel I would say that this is not far off the mark as it incorporates both elements in equal measures. If you’ve read Yann Martel’s Life of Pi you will know the main protagonist came from Pondicherry. Does this have anything to do with anything? No. Let’s get down to business. 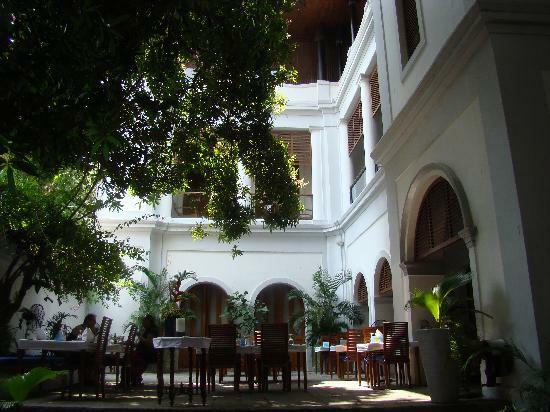 The building is an 18th century French colonial era villa built originally for the Mayor of Pondicherry and has been beautifully restored and modernized with designer elements. The attention to detail struck us from the first moment onwards with intricate woodwork cascading everywhere and a feeling of order and harmony lingering about the premises complimented by fragrant flower arrangements and ornamental pools of water with a feeling of entering an oasis or Zen garden of sorts rather than a commercial hotel complex. Or maybe it just felt like that after a megapolis like Chennai and a three hour ride on a mad highway. The area surrounding the hotel is likewise quiet and serene and only a short walking distance from the beach promenade with its lovely strolling possibilities – a luxury not always available in India. A perfect location for such a lovely building, just don’t let your driver take you to a place called Duplex, which is something completely different. We arrived in Pondicherry from Chennai where we spent some days before heading for a quieter time by the ocean after wrapping up some work. Driving along the towns busy main thoroughfare does not prepare the unsuspecting traveler for the tranquil whitewashed old town that suddenly appears seemingly out of nowhere as the hustle and bustle comes to a halt and one gets a feeling of time turning back a fairly generous set of decades. I do love the hustle and bustle of Indian bazaars and market areas but I am also happy to enjoy a serene old world setting when the chance presents itself. And if laid back old world charm is your preferred choice for a holiday then no better place than on Rue de la Caserne. The room we ended up in (after some initial hassles) was a suite on the second floor with lovely wooden furniture, a balcony with a view that hasn’t changed in two hundred years and a charming second floor gallery. And let’s not forget a well stocked mini bar, after all Pondicherry is a union territory separate from Tamil Nadu with a more lenient attitude towards alcohol and lighter taxation. The bathroom was very sweet and lovely with its wooden décor and with cute details such as flower petals placed on towels. Only for hopeless romantics this place. Having said that be warned that the rooms vary a lot and we did have a chance to see three other options before finally settling on room number 5, which possibly with the exception of the penthouse must be the queen’s chamber of Le Dupleix. Don’t hesitate to ask for it when making your reservation. I cannot wait any longer to get to the food part. Eating in Le Dupleix happens in the ever so nicely laid out courtyard beneath the shade of a two hundred year old mango tree. And what an experience this is! If there was one thing about Le Dupleix that impressed us it was the offerings of the kitchen and the ambience of the courtyard where to savor it. During my years in South India I have rarely come across a kitchen of this caliber serving seafood and Mediterranean and Indian cuisine. Right from the starters onwards we knew that we were in for a treat. Along with the food to our delight there was also a decent choice of white, red and sparkling wines, mostly from Indian vineyards. Later we found out that the cook of the place has indeed been highly acclaimed in the media for his innovative cooking and use of fresh organic materials. 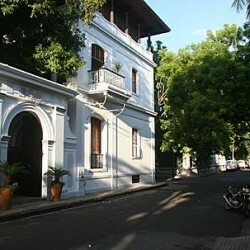 Even if not staying in the hotel make it a point to go and savor its delights when visiting Pondicherry. I will refrain from recommending a specific dish as surely you will want to experiment according to your own taste but I do place my wager that you will not retire from the table without a big smile on your face. Everything here is in place: aesthetics, taste, cleanliness and the wonderful personnel and staff who were all smiles and helpful all the time and deserve special praise for their hard work and polite way of making us feel welcome all throughout our stay. The ecologically aware standards of the hotel certainly also deserve points. On arrival we were asked if we would prefer room number 1 over room number 9 with the understanding that the only difference would be the bed therein, yet in retrospect we understood that actually the idea was to guide us to make the right choice of not taking the room that had a problem. Not getting the “hint” we chose the room we preferred and which seemed to deliver what was sold to us only to find out after unpacking that the air conditioning was barely functioning. We let the management know about this with the result that one staff member was sent to check on the situation. After this nothing happened. When I called the reception they said they were aware of the problem in the room. But the odd thing was they were just sitting on that information seemingly hoping that we would somehow reconcile ourselves to the +35c temperature of the room. a) Is it sensible to keep air conditioning in a disfunctioning state in such an upscale place especially during high season? This will certainly be enough for some guests to think twice about returning to such a place during their next visit. b) Why not tell the guest what the situation honestly is and what options they have as far as the choice of rooms goes? Honesty in this matter would have saved us several hours of wasted time and the hotel staff great pains shifting our things from room to room. This is a customer service problem that I sometimes come across in India and while the intention is good in that “let’s not upset the customer by telling the unpleasant truth” it always backfires and ends up making the customer more upset than necessary. I would warmly recommend hotel management not just in Le Dupleix, but also elsewhere to be frank and let the customers know what their options are rather than try to use white lies to mislead them. This will lead to far better results in the long run, I promise you that. Eventually we were compensated with a free dinner and upgraded to a better room, but this shouldn’t have taken three hours and endless unpacking and packing to the point of absurdity. Maybe in cooler climates a sense of humor would have prevailed better. All was good in the end though and well worth it as we had a lovely time and the place nevertheless comes highly recommended. Essentially all this boils down to cultural differences, Indian culture being very polite where it is not considered good manners to tell people bad news. Nevertheless when working in an international setting it would be advisable to consider a more transparent and straightforward approach. Having said all this please do not let it deter you from visiting this wonderful gem of a hotel, just make sure the AC is working before unpacking your things unless you enjoy running up and down corridors like a maniac with sweat pouring down your back. Now please go back to read the positive stuff above. Hope to see you in amma-retreat in july.